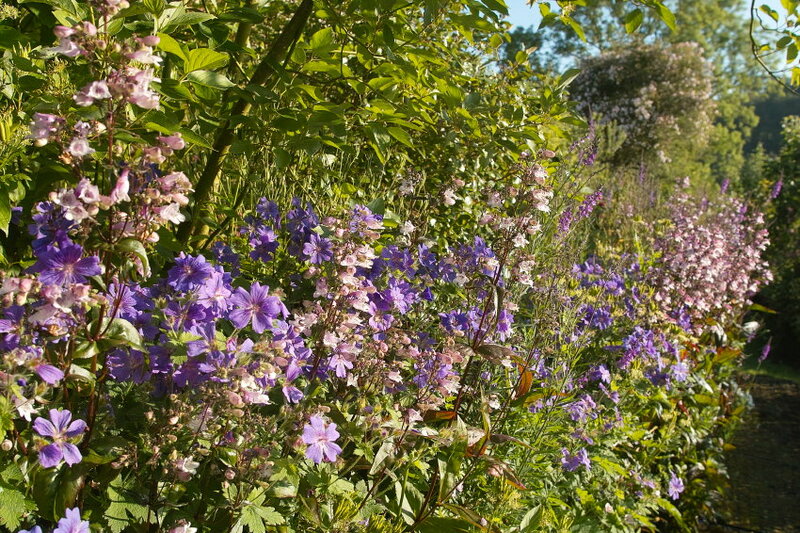 In 2010 we were delighted to be accepted into the National Garden Scheme (NGS), which enables selected private gardens in England and Wales to open to the public for charity, and we hope to be able to open under the scheme in future years. DO PLEASE CONTACT US BEFORE VISITING. It’s possible that in future, we may have “pop up” openings at very short notice at other times of the year, if the garden is looking good, the weather looks fair, and we have enough time to arrange it. If you’d like a chance to visit us if we do this, then either “follow” my blog (click on the box on the right hand side of the website home page), since I’d always put up a post that this was about to happen. Or drop us an email and leave us your contact details. These openings will always end up being at very short notice – maybe only 2 or 3 days, but would give people a chance to see what the garden looks like at other seasons. It will therefore require a speedy response to book a place if we do decide to open in this way. PLEASE DON’T JUST TURN UP – THERE WON’T BE ANY PARKING SPACE & YOU’LL PROBABLY HAVE HAD A LONG WASTED JOURNEY! To arrange a garden visit for 2019 please contact us. For 2019 we currently plan to open only on the third weekend of the month in February and only by prior arrangement because of parking issues, with fixed time entries at 10.30 am and 2.30 pm. But do check back nearer the time to confirm these dates. Do also check weather forecasts before leaving – sometimes access to the garden is impossible… Larger groups of more than 10 may be able to arrange visits for other days, but you must bring a group of at least 10 for us to open in this way specially for you. The garden now has millions of bulbs in it, but every year we still plant lots more and have more of a story to tell about snowdrops from our ongoing Welsh historic snowdrop hunt, (click here), so if you’d like to visit, why not plan a trip now with some friends? I also set up and managed for the first 3 years the website for the Carmarthenshire Meadows Group, (click here) which may be of interest to readers, and encouraging more flowers and other wildlife into our meadows is an ongoing project here. In 2016 and 2017 we were one of about 120 locations across the UK which opened our meadows (and gardens as well) under the National Meadows Day initiative. From 2019, visitors will have a chance to enjoy the views, whatever the weather, from our unique Shepherd’s Hut, designed and built by us in the summer of 2018. Click here for a separate website page about “The Hut”. Garden View pages accessed via the drop down boxes at the top of the home page are designed to give an idea of what you might expect to see through the seasons (as well as being a record for us of how the seasons vary year on year, and how the garden is inevitably changing over time). 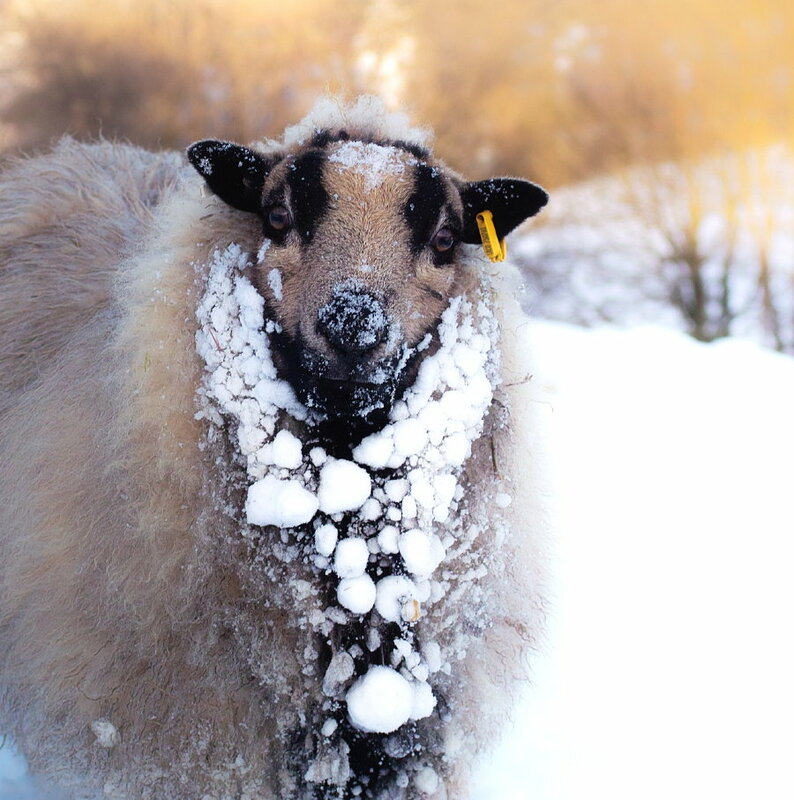 Please also bear in mind that some parts of the garden are steep and in wet or icy weather, parts can become slippery so do wear appropriate foot wear, and if necessary bring walking sticks, umbrellas and warm clothing. For roughly minute length clips of video with natural sound from the garden, please click on the following link to a sample video from our ‘ImpressionistGarden’ site on You Tube, or as from 2018, there will be a few short clips in the monthly Garden Views pages. 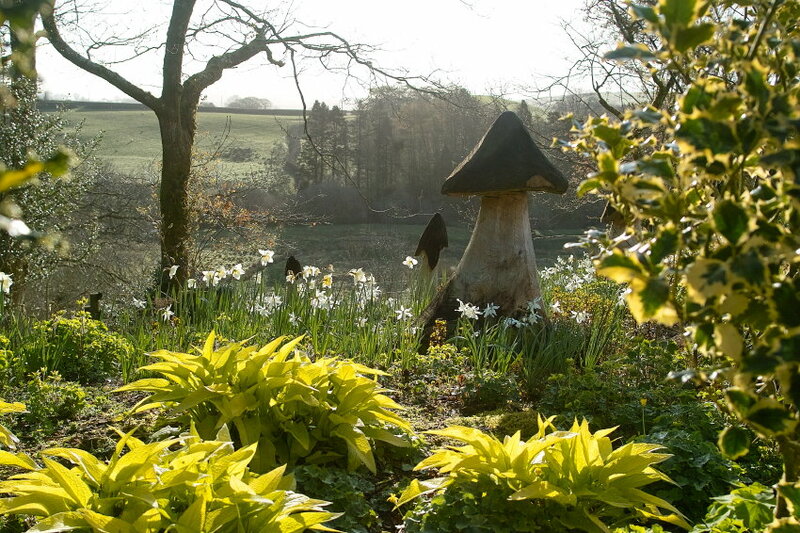 ‘One of the Best Snowdrop Events to Visit in 2018’ Daily Telegraph. Click here. 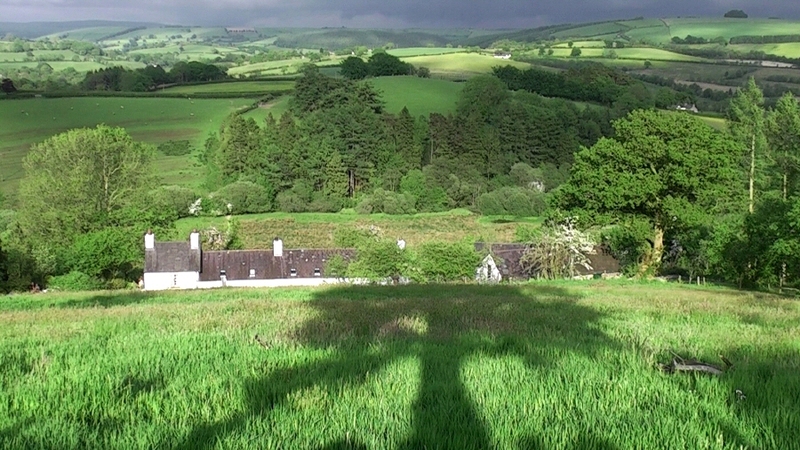 ‘Wonderful day despite the deluge – we’ll be back.’ AJ +3 Llanrhystud. 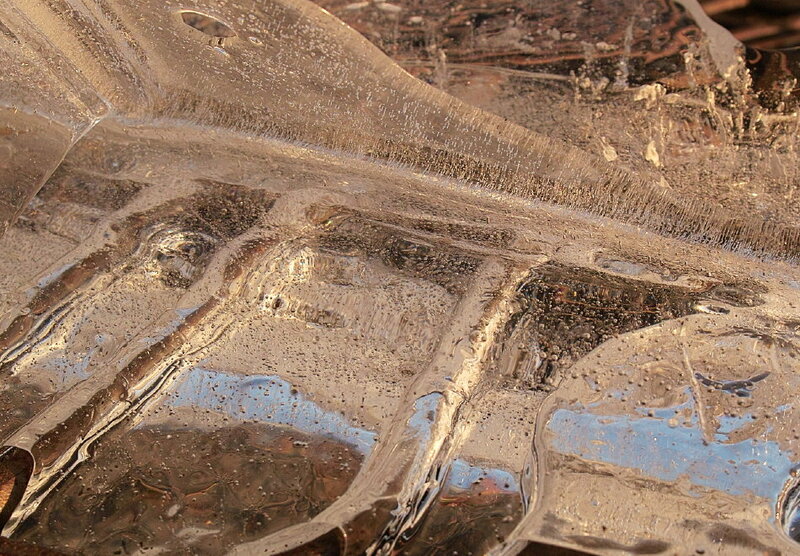 ‘They have used colour densely and vibrantly as an impressionist painter might. 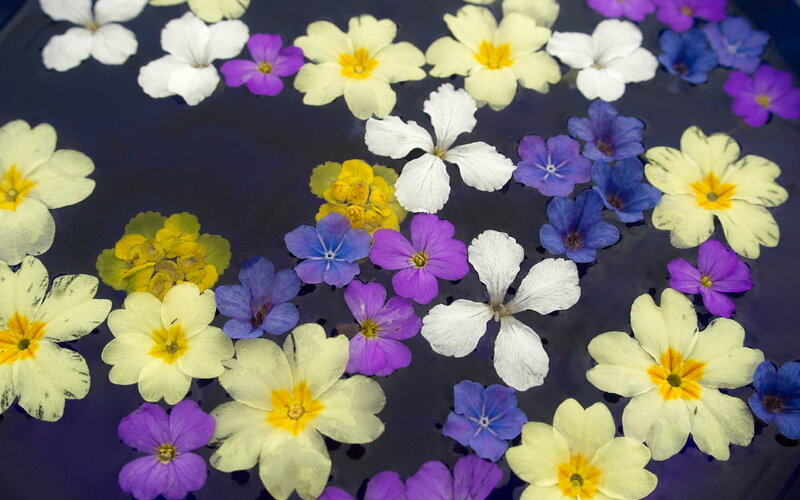 Drifts of small flowers mimic painting techniques such as pointillism – painting with small dots of colour; foliage patterns resemble short, distinct brush strokes while the changing light, shadow and the moving season is a constant feature, making the garden as fresh and original as the ground-breaking French impressionists themselves.’ Naomi Slade – Amateur Gardening Magazine. 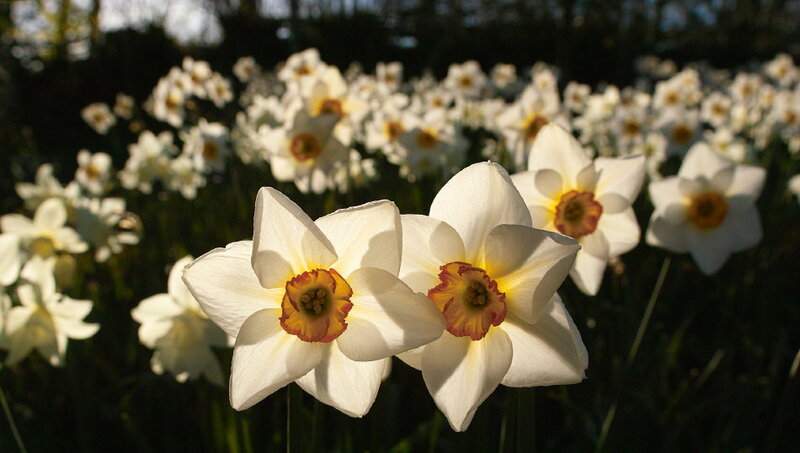 ‘Even better than the snowdrops’ R&L Egylwswrw. ‘Forget the perfect trophy garden. Today’s finest landscapes are positively wild…Some of the gardens are lower-key but no less naturalistic or reflective of gentle artistry. 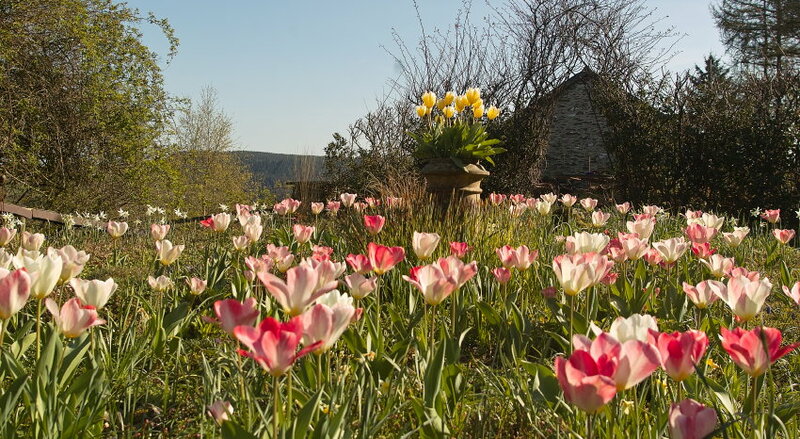 In the Welsh hills of Carmarthenshire, Julian and Fiona Wormald have spent 24 years creating a densely planted, multilayered garden of bulbs, perennials and shrubs around their 17th-century Welsh longhouse.’ Adrian Higgins. Washington Post. Click here. 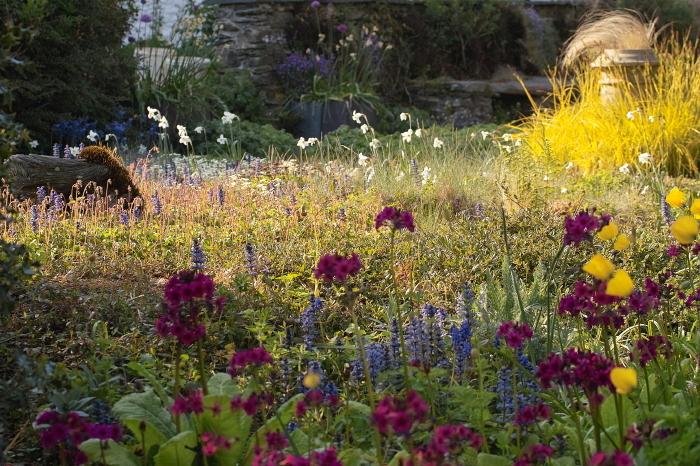 ‘As soon as you step out onto the terrace in front of the house – a riotous tapestry of low growing ground-cover plants – it becomes immediately apparent that this is no ordinary garden. Delve a little deeper and you find that this is a garden that brings together real technical innovation and creativity in a way that is all too rare’. Noel Kingsbury Gardens Illustrated magazine June 2017. ‘Fantastic meadows and garden. Learnt a lot from visiting.’ BC Gloucestershire. ‘Truly wonderful. Gardens within a garden and amazing plants and natural effects’. M.T. Salem W.I. Group visit. 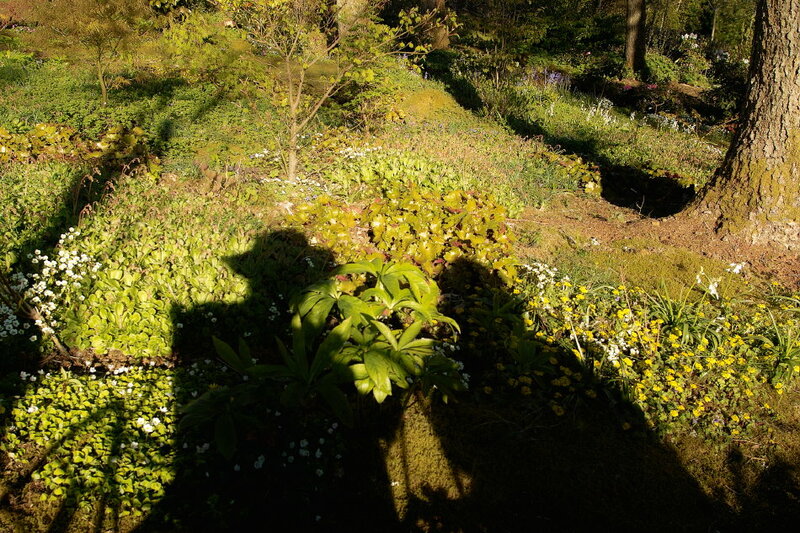 ‘A truly magical garden.Thanks for your hospitality’. G.J.&.P. Llandrindod Wells. Some of the images Julian has taken over the years in the garden have formed the basis for a unique range of silk scarves which we design and Fiona makes here. Click here for the separate webpage which features the scarves. We may have a few interesting plants available for visitors to purchase at reasonable prices, but are gradually phasing out plants for sale as we get creakier, apart from snowdrops for our spring openings, and after the challenges of both harsh winters and lack of any water following a severe drought in 2018. 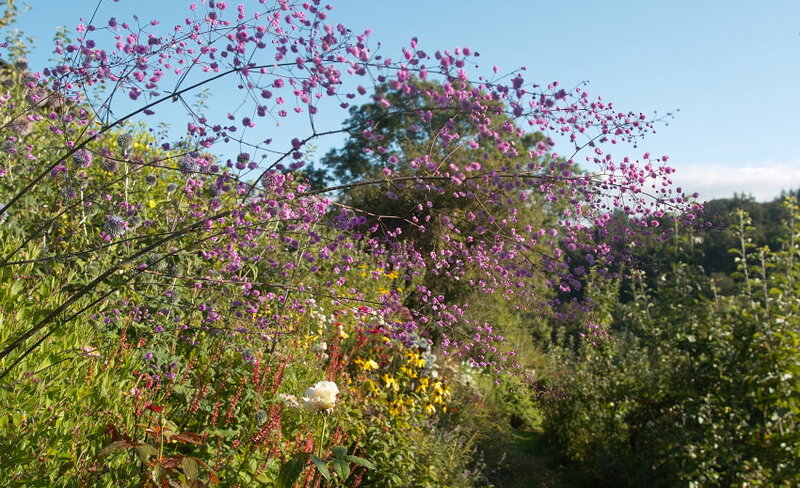 We only grow plants which we enjoy and which thrive here, and much in the garden has indeed been propagated by us, including many trees from seeds and perennials from cuttings and divisions. We have a small unheated greenhouse, but all of our plants have to survive in our climate without any real cosseting, and are grown in our own soil/leaf-mould based compost to avoid buying in much in the way of planting materials. Take the A40 for Llandeilo. In Llanwrda turn right onto the A482. After about 6 miles immediately before a sharp right hand bend, bear left downhill onto a narrow road to Crugybar and Llansawel. 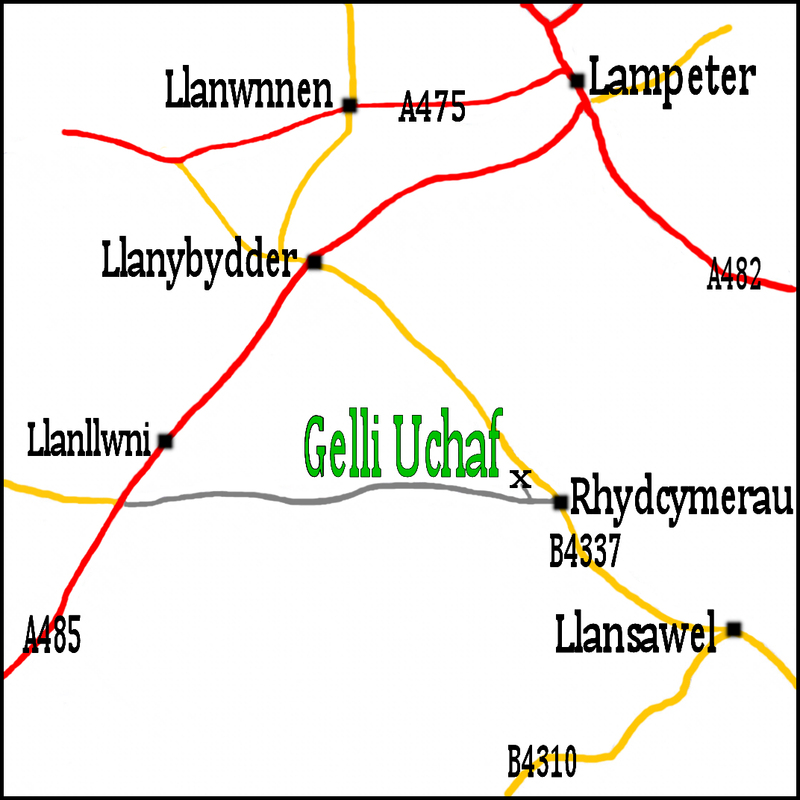 Continue straight on for about 2 miles, and then turn left at the T junction, and immediately right for Llansawel. In Llansawel turn right at the T junction, with the Angel Inn on your left, then continue out of the village, bearing right past the chapel, until you reach Rhydcymerau after about 4 miles. In the village take the left turn signed to Llidiad Nenog. (There is a phone box on the corner which you pass). About 200 yards further on turn right up a half mile farm track immediately beyond a new bungalow – there are 2 mail boxes at the end of our track with house names. The track has rain run off channels (like mini reverse sleeping policemen! ), so please drive slowly. Bear right up the hill at the first property to reach Gelli Uchaf which is at the end of the track. Take the A40 towards Llandovery and then very quickly take the first left onto the B4302 signed to Talley. Continue along this road through Talley. About a mile beyond Talley turn left onto the B 4337 signed to Llansawel and Llanybydder. You cross the river Cothi almost immediately. Continue straight on through Llansawel, bearing right past the chapel, until you reach Rhydcymerau after about 4 miles. In the village take the left turn signed to Llidiad Nenog. (There is a phone box on the corner which you pass). About 200 yards further on turn right up a half mile farm track immediately beyond a new bungalow – there are 2 mail boxes at the end of our track with house names. The track has rain run off channels (like mini reverse sleeping policemen! ), so please drive slowly. Bear right up the hill at the first property to reach Gelli Uchaf which is at the end of the track. From the A485 in Llanybydder take the B 4337 towards Llansawel. Follow this for about 4 miles into Rhydcymerau. Take the first turn right in the village opposite a row of bungalows and continue for about 200 yards and then turn right up a half mile farm track immediately beyond a new bungalow – there are 2 mail boxes at the end of our track, with house names. The track has rain run off channels (like mini reverse sleeping policemen! ), so please drive slowly. Bear right up the hill at the first property to reach Gelli Uchaf which is at the end of the track. Take the A485 from Carmarthen. In Llanllwni take the first turn right, (after the B4436 left turn to Llandysul). This takes you up over Mynydd Llanllwni. Follow this road over the mountain, straight on at all junctions heading for Rhydcymerau, and enjoy some of the best views in Wales! Once you have come down the hill, and just before the village sign on the right, turn left up a half mile farm track immediately before a new bungalow – there are 2 mail boxes at the end of our track, with house names. The track has rain run off channels (like mini reverse sleeping policemen! ), so please drive slowly. Bear right up the hill at the first property to reach Gelli Uchaf which is at the end of the track. If you’re travelling a distance, why not think of also visiting these other nearby attractions whilst you’re in the area. We can personally recommend all of them as being both beautiful, unique, and value for money experiences, and are where we take visitors. When we have a day off …. Aberglasney Gardens. 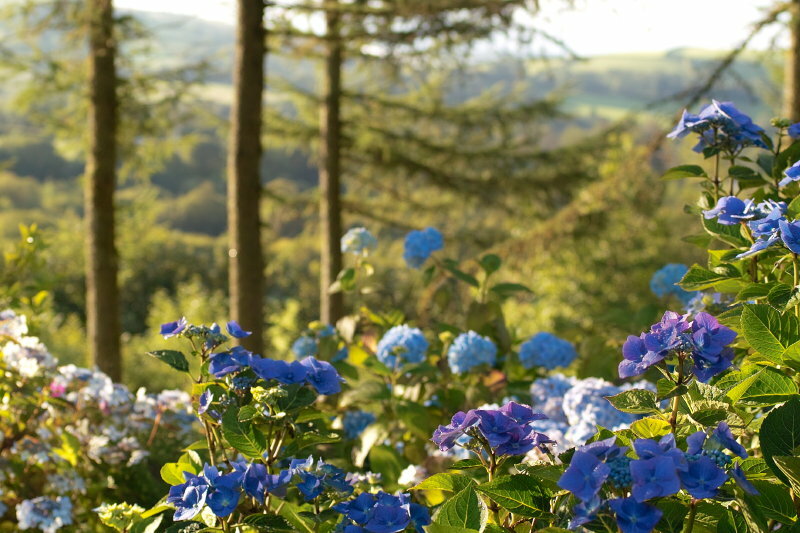 Restored over the last 15 years, in a wonderful setting in the Towey valley, these acclaimed gardens are a mix of centuries of hard landscaping and contemporary planting, with a mature wooded backdrop. Click here for details. 40 minutes from the garden. The National Botanic Garden of Wales. Another massive project developed around the millenium and maturing and improving year on year. Difficult to see it all on one visit, but always something of interest at any time of the year, around a very extensive site. We have become life members, to enjoy its ongoing developments on a regular basis. Click here for details. 50 minutes from the garden. The Pembrokeshire Coastal Path. Stretching from Amroth in the South to Poppit Sands in the North, this stunning path is listed in the top ten of global hikes. Some rank it as number 2. With stunning scenery for most of the route, interesting towns and villages along the way, and excellent public transport links via the Pembrokeshire Council operated shuttle buses which serve the whole route, small sections can easily be tackled. Much of it is within one and a quarter to one and a half hours drive from our garden. For a brilliant idea of what the scenery is like, follow the link to the wonderful record created by my brother in law, who walked the whole of it in 18 days in the spring of 2013. Click here for the link. The Llanerchaeron Estate. 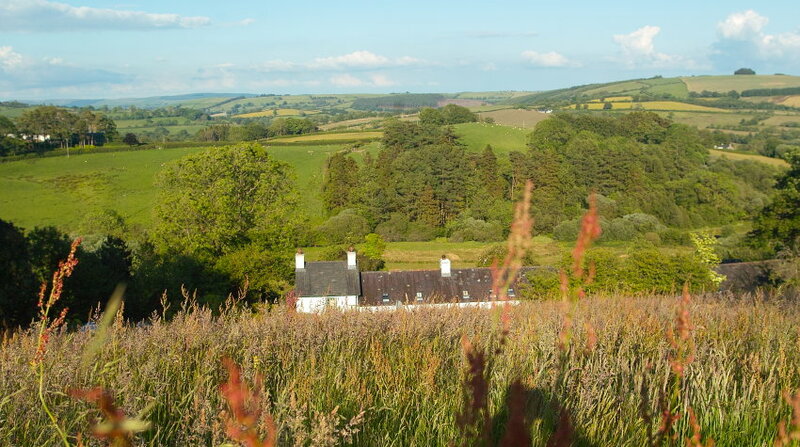 About 40 minutes from the garden towards the coast at Aberaeron, this is our favourite National Trust property locally. A pretty, and unique small scale working self sufficient estate created in the C18th around a beautiful historic early John Nash designed house. Worth visiting for the house, estate and farm buildings and gorgeous, still productive, walled fruit and vegetable garden. Click here for link. Dinefwr Park and Castle is the other National Trust property close by which is almost as interesting (about 25 minutes from the garden). A C12th Welsh castle commanding the Towey valley, interesting historic mansion and C18th deer park with both deer and long horned white cattle, located on the doorstep of the lovely town of Llandeilo. Click here for link. 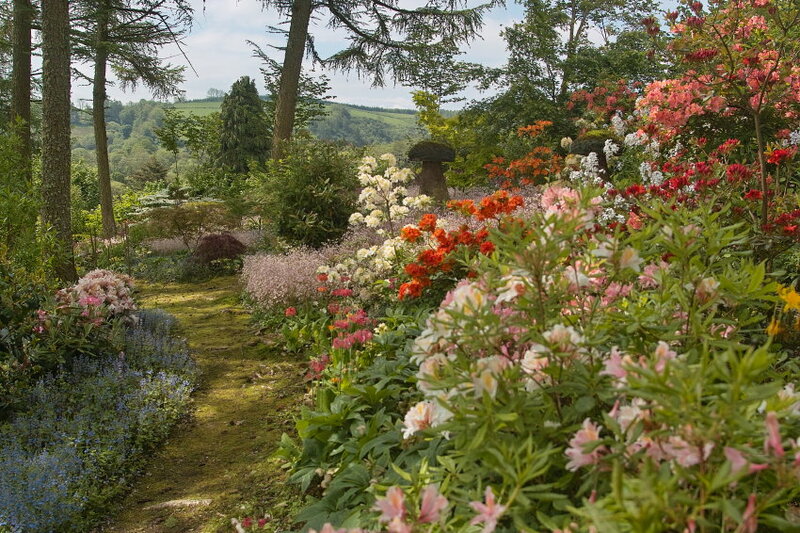 There are many other lovely private gardens to visit in the local area, opening like us through the NGS. 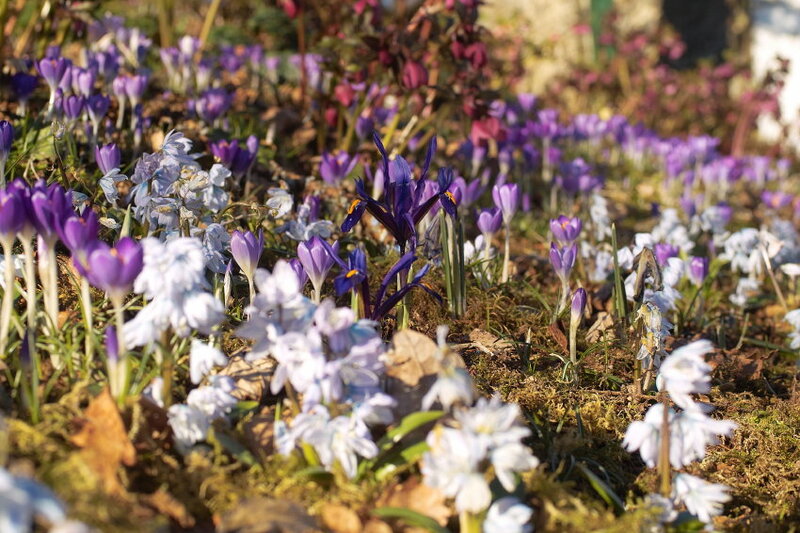 Click here for the NGS garden finder web pages.